Before I tell you about my first experience with Corned Beef and Cabbage I want to share with you something that I recently learned. I entered the name of my blog into Google to see where I might be... Unknown to me, somebody has snatched my blog and has it feeding into another blog at DoLinkToMe.com. They have surrounded the blog with advertising..hormones, herbal remedies, etc. The ads change. I have been very upset that somebody would do this to make money. (Guess I shouldn't be...) It is so inappropriate! Out of curiosity I searched the blog name of some of my blogger friends. I did not find that they had this special treatment! (Thank goodness.) My question to all of you is: Has this happened to you? How do you keep it from happening? What steps can be taken so that somebody cannot do this? I am very much interested in your experiences. I remember eating corned beef and cabbage when I lived at home. I loved it! 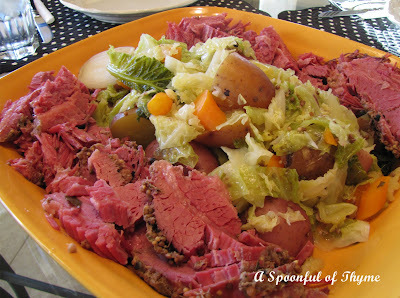 I love cabbage, corned beef, potatoes, carrots...so of course I would love this dish. I decided that I should make it as part of my St. Patrick's challenge but along the way I learned something. I learned that Corned Beef And Cabbage is not Irish. I had no idea. My curiosity was sparked when JanMary left me a St. Patrick's Day greeting along with the following note, "I have never had or made corned beef - but I think we are missing out here in Ireland and need to give it a try!" What? It isn't Irish? The researcher in me started reading...I learned that before the mid-19th century Ireland exported most of its beef so it was not readily available to the majority of Irish citizens. It was an indulgence of royalty. Beef was raised for dairy products, sheep were raised for wool leaving pigs for the peasants to eat. Irish emigrants found their way to America after the potato blight in the mid-19th century. They saw that corned beef was more readily available here. 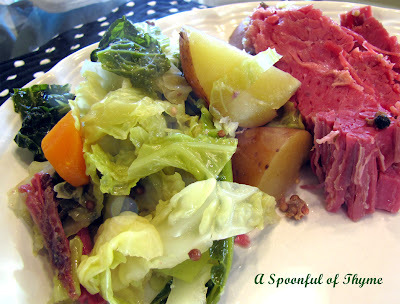 They ate corned beef and cabbage not because they were Irish but because these items were inexpensive, available, and popular among the working class! It wasn't until the 1920's that corned beef and cabbage came to have an association with Irish cooking! So, thank you JanMary and Kathleen for letting me know that this dish is not a traditional Irish meal! Some folks rinse their corned beef and then add the spices: allspice, bay, salt...I took the shortest path to a good meal! Place the corned beef in a large Dutch oven that has a tight fitting lid. Cover the corned beef with water. Bring to a boil. Cover and place in the oven, braise until very tender, about 4 hours. Transfer the corned beef to a cutting board and cover with foil. Add the cabbage, potatoes and carrots to the cooking liquid and bring to a boil. Lower the heat and simmer until the vegetables are tender, about 20-30 minutes. 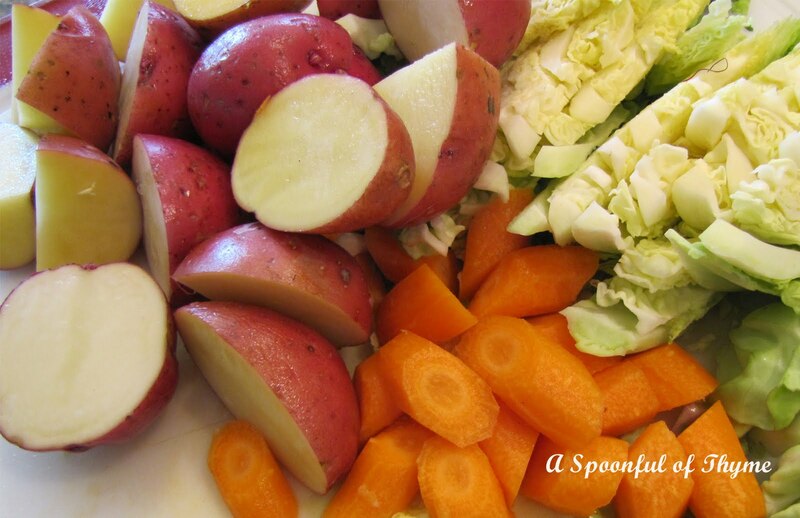 Use a slotted spoon, transfer the cabbage, potatoes and carrots to a large platter. 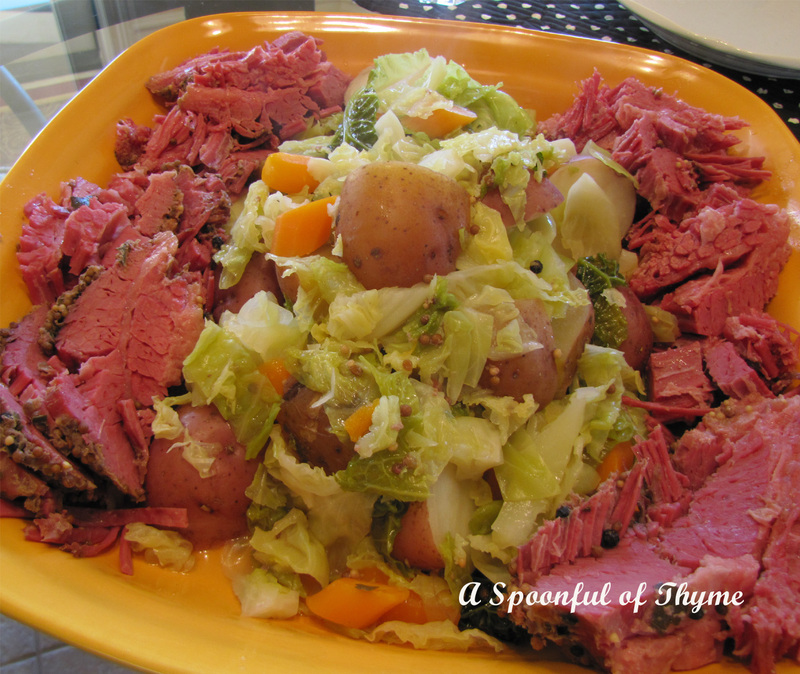 Slice the corned beef and arrange around the vegetables. Spoon additional cooking liquid over the corned beef, if desired. Serve with mustard or a Horseradish sauce. This is such a simple dish that I have no idea why it took me so long to make it! Yes, it's happened to me. Report it. That is why I put watermarks on all my photos. GOOGLE how to protect yourself and lots of info comes up. Someone is streaming my blog-- they are selling kitchen gadgets and don't give credit to me. It's very frustrating and I don't like it one bit. So sorry to hear that. I was craving corned beef, myself. Trader Joe's is all sold out. Waaaaaaaah! i hate hackers like that--unacceptable. i probably need to check for myself! on a brighter note, your plate of food looks spectacular--so many flavors, colors, and textures. very nice, kate! Kathleen makes this a lot also.. I have never made it..It's not available where I have looked here.. Thanks for the tip..re blogs..Wow..imagine that.